Many herbs tolerate being grown within the confines of containers, and people have grown herbs this way for centuries all over the world. Growing herbs in containers is obviously ideal for those with little garden space. liven if you have a herb garden, you might like to have a few culinary herbs in containers as well, conveniently near the kitchen door or on a windowsill. Containers are useful for controlling spreading herbs such as mints, which can be invasive. They have the advantage of being portable, enabling you to place plants in their ideal amount of sun or shade, or to move tender plants indoors in winter. Pots also allow you to provide the right soil and water conditions for individual plants — useful for gardeners who have to cope with extremely alkaline, stony, or otherwise difficult soils. Containers offer scope for creating handsome plant combinations and for making groupings of particular herbs, such as Italian cooking herbs or herbs for teas. Culinary herbs that do well in pots include basil, bay, chervil, chives, lemon balm, sweet marjoram, mints, parsley, rosemary, sage, savory, tarragon, and thyme. Ornamental herbs suitable for pots include bee balm, calendula, chamomile, feverfew, and lavender. When choosing the container size, take into account the size of the mature plant and make sure that the container is deep enough to accommodate the roots. Make sure the pot has at least one hole in the bottom for drainage. Most herbs require a minimum depth of 20 cm (8 inches). Peppermint and other mints, and feverfew, which can grow up to 1 m (3 feet) high, need pots at least 30 cm (1 foot) across and 25 cm (10 inches) deep. Tall ‘strawberry’ pots can accommodate several smaller herbs. Large herbs such as rosemary and bay look attractive when grown singly in large individual pots. Clay pots are best for herbs that need good drainage; plastic or ceramic pots are better for plants such as mints and basil that require moisture. However, clay pots filled with soil will crack if temperatures drop much below zero. Large clay pots are extremely heavy once filled with soil (this may be an advantage in a windy spot). If planting more than one herb in a pot, use a larger pot and group plants according to their requirements for sun or shade, moisture, and soil type. and 4 parts peat moss. Cover the bottom or the pot with gravel or pieces of broken clay pot to ensure good drainage. Some herbs – basil, bay, chives, dill, ginger, marjoram, the mints, oregano, parsley, rosemary, sage, and winter savory — can be grown indoors. They need a lot of light, so place them on a sunny windowsill or on a table next to the window. 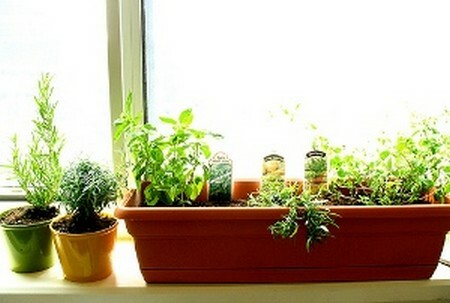 Avoid putting indoor herbs above a radiator, or where they will be subjected to fluctuating temperatures or drafts.